This cold-weather meal is easy on the love handles! 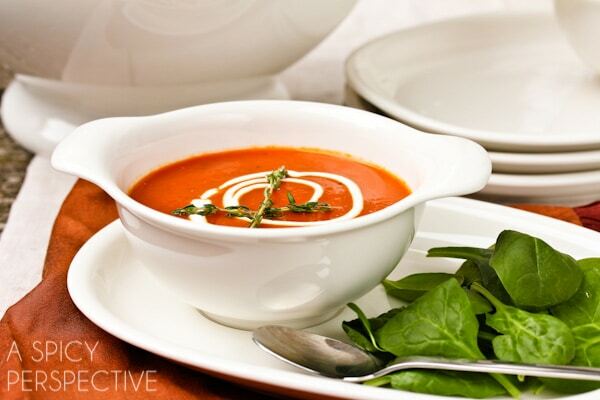 Roasted Red Pepper Soup offers big flavor without busting your newly-made resolution. Let me guess… You are going to be nicer to your neighbor, spend more time with your kids, take a class at your local community college, and lose 10 pounds this year. Did I get it right??? We all tend to add a healthy objective to our list of new year’s resolutions. After two months of gorging ourselves on oven-baked dishes smothered in gravy, boxes of Christmas cookies, and hefty cheese platters, it’s time for a clean sweep. A good veggie soup is a great thing to add to your new healthy routine. Soup can fill you up, while making your meals substantially lighter in calories, fat and carbohydrates. This roasted red pepper soup is gluten free, dairy free, low carb, low calorie and oh so delightful. The vibrant sweet and tangy flavor of freshly roasted red peppers, combined with roasted garlic, herbs and a kick of spice make it extremely satisfying. Plus, it’s a great leftover to take to work for lunch. 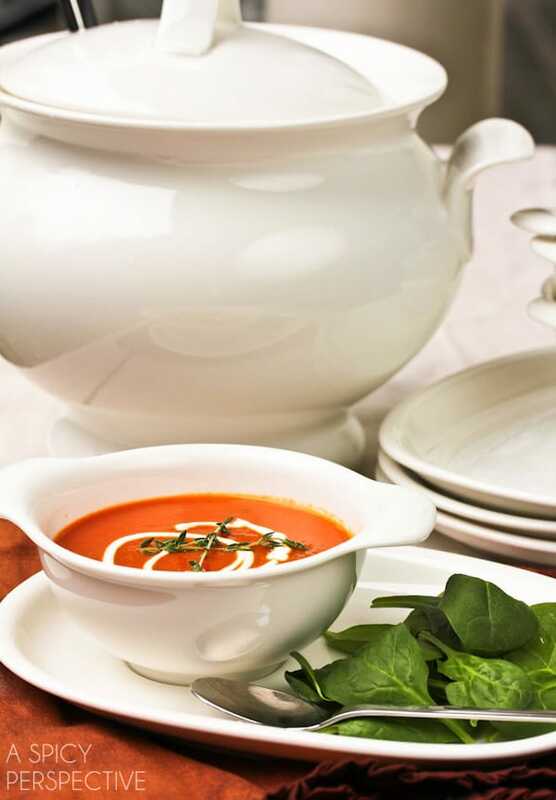 You’ll have jealous co-workers eagerly peeping over your cubical when they smell your creamy roasted red pepper soup. You may need to make a double batch! 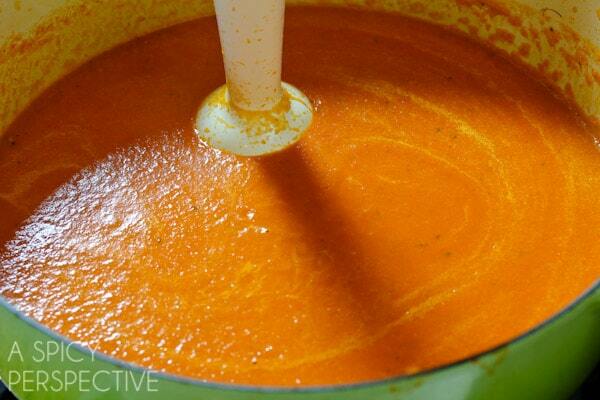 This particular Roasted Red Pepper Soup is one of my hubby’s favorite dishes. He has asked me to make it time and time again. It always amazes me that a steak-sandwich-kind-of-guy could crave gluten free, meat free soup the way he does. Yet after one taste, you’ll understand the appeal of this marvelous soup! Cut the peppers in half and remove all seeds and membranes. 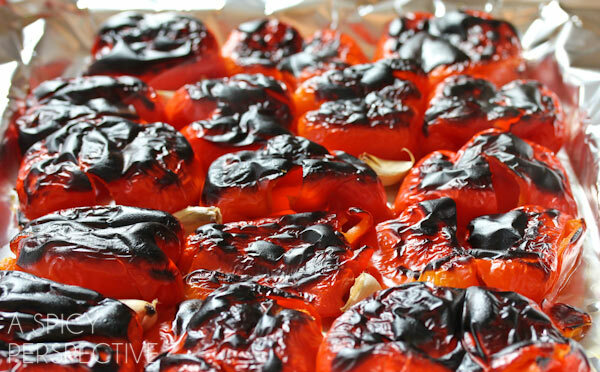 Press the red peppers flat with your hand and lay them on a foil lined, rimmed baking sheet. Place the garlic cloves on the baking sheet. Set the oven on broil and raise the rack to the upper position. Broil the red peppers and garlic for 15 minutes. Preheat a large heavy pot to medium heat. Add the oil, thyme, bay leaves, and onions. Cook for 10 minutes, until onions are soft. Add the broth, hot sauce, salt and pepper. Squeeze the garlic cloves out of the peels into the pot. Then peel the charred skin off each pepper half and place it in the pot. Reduce the heat, cover, and cook another 20 minutes. Remove the bay leaves and thyme sprigs. Then, using a hand-held immersion blender or standard blender, blend until smooth. 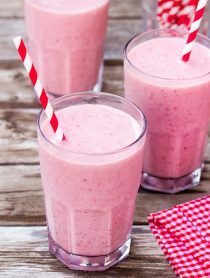 *If using a blender, be sure to remove the plug on the lid and cover with a kitchen towel—this with allow the heat to vent without a big mess! Add the vinegar and salt again if needed. I have made this soup probably a dozen times or so, but I also add 3 cans of fire roasted tomatoes and we just love it! This sounds so good, definitely going to give this a go. Thank you. What should I do with the fresh of the peppers? It is not mentioned whether I should discard them or use them or other purpose. I made this soup yesterday and absolutely loved it. I didn’t add the vinegar since I couldn’t find it in the store and it still was delicious. I also had some bacon left over and sprinkled it over the top, defenitely going to do that again! Thanks for the recipe! I’d next time leave out the vinegar and cut way back on the onion. Made the soup almost sour. Managed to bring it back with some sweet potato and a couple of carrots. Yum! We loved it. Thanks for the great recipe. I’m making this now. I have to say I do not love the smell of the thyme. Hoping it will still taste okay. I may have to try it again with different seasonings. The combination of vegetables and herbs sounds perfect! I’m definitely pinning this! Until now – now there are Weber Performance Grills that offer the best of both grilling worlds. Broilmasters is one the highest quality and most efficient natural gas grills available today. the high temperature allows chefs to grill meats to perfection within minutes. I was looking for a recipe for roasted red pepper soup today and found this one. It looks so yummy.and the color is just beautiful. I can’t wait to try it out! The color of the soup just pops off the screen! That looks amazing. making me hungry and I ate a huge meal today and am not hungry! Good job. I love that your hubby lives this soup! 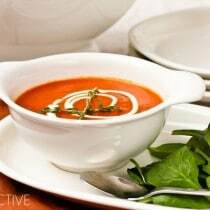 I’ve never made roasted red pepper soup, this looks delish! Very appetizing soup! Wish I had seen it two weeks ago when I had an abundance of baked peppers. Wow! I’ve been thinking about doing a similiar recipe….looks amazing and I bet the rice vinegar gives it a nice finish. Good idea! Pingback: Healthy Soup Recipes & 6th Annual Acoustic Soup Event | Ingredients, Inc.
Oh I love this! The color is insane! I can imagine how good it tastes, the roasted peppers sound great! This soup looks amazing! Definitely on my must-make list! Great color on that soup. I’m a big fan of roasted peppers in general, so this is looking super tasty to me. I think I would add some golden croutons on top, but that would certainly take it out of the gluten free genre! 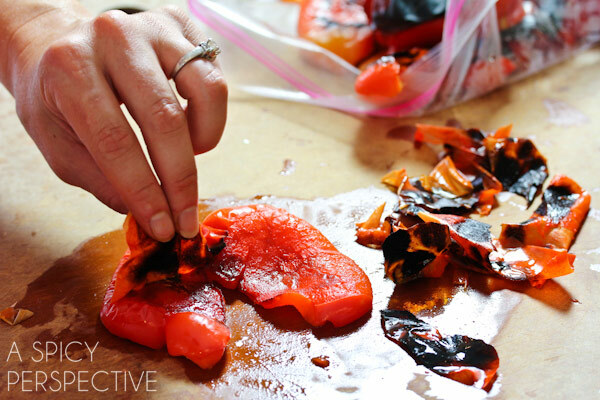 i love roasting bell peppers, most of the time during summer since they are not so pricy. What a stunning soup…the color is fantastic, and no doubt just as delicious as it is beautiful! The smell of roasted red peppers is one of my favorites! Just delicious! I’ve bookmarked this for sure…it sounds and looks fantastic! Also, the photography is amazing…thanks for sharing! What a perfectly lovely soup! 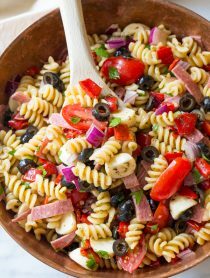 I just might have to make this for today’s lunch. Looks so divine! Roasted pepper is my fave! I love a good roasted red pepper soup. I will definitely add this to my “to-make” list. I LOVE your photographs – and that recipe is going on my new To Do List! What a healthy yet delicious bowl of soup! I will definitely make this one. Thanks! oh, how did you know I just love roasted red peppers, Spicy? thanks for this! This looks amazing, beautiful photos! I just got a new immersion blender too, I’ll be trying this soon! Love how gorgeous this healthy soup is! The roasted garlic, hot sauce and vinegar make this extra special. Gorgeous soup and I’m sure the flavors are amazing! I make roasted red pepper soup often. Love the depth of flavour – similar to yours, but not exactly the same. I like adding roasted peppers to a variety of soups for the smokey deep pepper flavour they add to the soup. Gorgeous color and a nice way to eat light but enjoy the warming comfort of soup during the cold months. holy vibrant color goodness, wow – seriously looks so delish. This looks great and what fabulous pictures! Can’t go wrong with such a great recipe! Roasted peppers sound wonderful and the soup looks amazing. Love this soup! Gorgeous photos too! I need to wear my glasses when trying to read online. I thought at first you wrote that this was easy on the hands. Love handles make a lot of sense! I am in total soup mode! This looks terrific. What a fantastic color. Happy New Year! Mmmm….I think I can taste this soup! Looks deeeeelish Sommer! Gorgeous pics and I love the Soup Plates..those rock! This is gorgeous, Sommer. I can see why your husband begs you to make it. The color is so pretty and I’m sure it has a light, fresh taste. Just wish red peppers weren’t so expensive now!! Will have to wait for summer . . . I enjoy roasting peppers and make a soup similar to this one but serve it chilled in the Summer. Yep..totally pinned this. Looks wonderful! Awesome recipe. I love the idea of broiling the peppers and garlic. 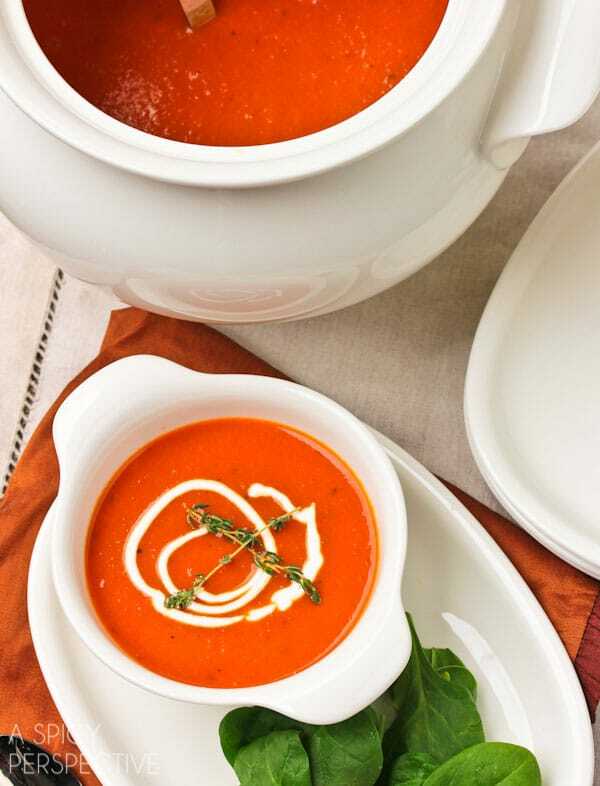 I love roasted red bell pepper soup…except mine is loaded with cream! I’m loving your healthy version…it looks amazing! Oh Sommer! Yum!!! It wasn’t until I got older that I started to like bell peppers. Reds are my absolute favorite but I’ve never tried the soup. On my to do list! I love red bell pepper soup! I like to make mine extra spicy, too. LOVE making soups this time of the year! You forgot, “get some bills paid” Other than that…I think you got the resolution bases covered. Beautiful photos! I always go for tomato soup and never red pepper. I have no idea why. This looks fantastic. Um, I just died. SLURP! I love making my own roasted peppers. 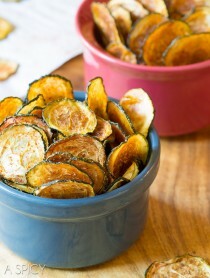 It’s so easy and the flavor is much better than the jarred versions. Fantastic pictures! I also need to loose some pounds and still have some of my roasted pepper soup in the freezer. Thanks for the reminder! Looks amazingly delicious and wholesome :) Perfect for this time of year! I have to say, love the hot sauce and rice vinegar in this! Love handles are loving me! Too much…this soup is on my list.